Weed Pro gives a holistic approach with their Fertilizer and Weed Control Programs. In addition to the great synthetic fertilizer we use in all our programs, every program includes three applications of our Soil Booster. Our competitors charge $50-75 for a single application, if they even offer it at all. Soil Booster adds vitamins and minerals to your soil and allows the grass plant to absorb fertilizer and water better. We have seen the difference it has made in our lawns and believe in the benefits so strongly, that we want all our lawns to be just that much more healthy and looking awesome all summer long. There has been an increase in chinch bug and sod web worm activity in Regina and White City over the past few years. With many of our customer’s neighbours having these bugs, it is only a matter of time before they migrate into our customer’s lawns. The solution is simple and very safe. Again most of our competitors charge $50 or more to treat lawns for chinch bugs. At Weed Pro, we know that the problem will not go away unless treated, we see enough of it in Regina’s lawns and we know how quickly the damage can develop. Therefore we include treating your lawn for chinch bugs and sod webworms at no additional cost, should your lawn need it. It’s a part of our proactive holistic approach. Another distinguishing quality of our Silver, Gold and Platinum programs is the organic fertilizer. This fertilizer breathes life into your soil by increasing the microbial activity and by re-mineralizing tired soils. Using both synthetic and organic fertilizer in the same program feeds both the grass and the soil. Your lawn will love us and you will love the results too! Weed Pro doesn’t cut corners. 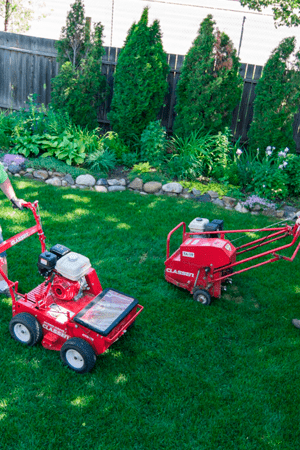 Weed Control is applied by licensed and certified technicians. All our programs include our Weed Free Guarantee with unlimited touch ups between visits. The Bronze Program uses a high quality synthetic fertilizer with a micro package. This fertilizer is awesome for your lawn and produces great results! Our Soil Booster feeds your lawn amino acids and vitamins, which helps your lawn fight the stresses of heat and winter. The Silver Program includes everything in our Bronze Program plus adds 3 applications of our high performance Organic Fertilizer. The aim of our organic fertilizer is to stimulate soil microbes and re-mineralize tired soils. The Gold Program includes everything in our Silver Program plus adds Aeration. The benefits of a less compacted soil include increased root development, increased water penetration and holding capacity, increased nutrient uptake from fertilizing, and increased break down of thatch. The Platinum Program includes everything in our Gold Program plus adds a second Aeration and Overseeding with a Topdressing. Weed Pro uses a slice seeding machine to implant grass seed directly into the soil, increasing the germination up to 90%. The benefits of overseeding are: it thickens up your lawn, and introduces new grass seed cultivars that are more insect resistant, more draught tolerant and have a deeper green colour.